My daughter begged me to serve her pancakes for her first day of school. Pancakes are usually a weekend treat, but how could I deny her? With all the craziness that goes on around here in the morning, I had to come up with something super easy. So, I read my own website - funny how I have to look things up that I have written, tested, eaten, etc. Blame it on mommy brain! Back in February, I posted: Overnight Pancakes . One commenter had problems with the pancakes cooking through (as did I) so I reworked the recipe for Ruby's first day of school. 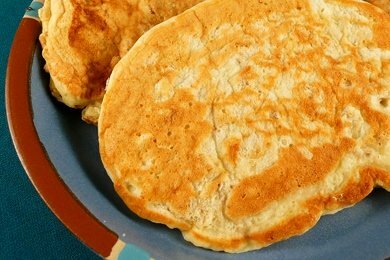 The AWESOME thing about this pancake recipe (as opposed to many others) is that includes 1/2 whole grains in the form of whole oats. Also, there is yogurt and eggs that pump up the nutritional value for a great start to the day. If you added Blueberries and some Which Peanut Butter is Healthiest?, you would make it to lunch without a mid-morning snack. You can leave this in the fridge for a couple of days and then cook as needed or cook them all at once and pop them in the microwave. These are also a great anytime snack. They look like a cookie, but aren't as laden with calories or sugar. Finally, the great thing about pancakes is that you get to eat a baked good without all the baking! They are done so fast and are a great replacement for an evil This Muffin Has a Dark Secret. What is your favorite quick and healthy breakfast idea? See, I just make a huge batch of pancakes or waffles on the weekend and use the leftovers throughout the week. I freeze them, with waxed paper between each layer so I can get them apart later. Then I can pull out just as many as the kids want, heat them in the micro or toaster until hot.. Thirty seconds in the micro for pancakes, or a standard toast setting for waffles to get them crispy and they're ready to eat. Homemade pancakes and waffles without having to cook on a weekday morning. It might not be *exactly* the same as a fresh cooked one, but it suits everyone involved just fine. We add sweet potatoes or bananas sometimes. Pancakes are a great breakfast, as long as you omit the oil and sugar... which I have found are completely un-needed. We also make extra on the weekends and freeze them! The kids love it, it's so easy and a great fast breakfast. Pop in the toaster or microwave. I just tried making peanut butter and jelly sandwiches with the frozen pancakes (Toasted) for a quick treat after school and before soccer practice. They loved it because it was new and different. This is a great idea... I've been buying Eggo's for our grab and go breakfast, I started with the whole wheat ones, but then I just got whatever was on sale and I've been thinking I should just make my own. We just toast them and add a little PB & J. It would be less expensive and I can choose the ingredients if I make my own. Thanks for the recipe, I can't wait to try it! I am curious...can you use Fage 0% yogart and skim milk in your recipe? You can use any type of yogurt or milk in the recipe. Sorry I didn't include that. Looks fabulous! Do they have a lot of texture from the oatmeal or does soaking it overnight eliminate that? They have a little texture - but my kids don't mind it and I think it tastes really good. Give 'em a try! Do you pour all the batter into the pan at once, making one giant pancake? I have a child that hates to eat anything that's been reheated, so I can't wait to try this recipe! Making them over the weekend and reheating doesn't work here, so thanks for the idea and the healthier recipe! Add-ins that I love are pumpkin pack and a dash of cinnamon! Thanks for the healthy recipe! Oh, That was a dumb question I asked. I just made a batch ... that will make many pancakes! Next time, could I use whole wheat flour in place of the white, or maybe half and half? I have blue berries to add in the morning. I cannot wait! Does anyone know what the weight watcher points are for the pancake? Thanks for the points. I'm on the WW plan, too, but in this instance, what is considered a serving? Is it just one 4-inch pancake? I'm trying this recipe as waffles... Crossing my fingers it is delicious! That is our dinner tonight. I tried these, just now and they were delicious!! I used the oatmeal in the packets, those are instant right? But they worked! I also mashed 1/2 of a banana and added that to the batter. How many pancakes is a serving 1 2 3 or 4 1/4 cup in batter or a 1/2 cup in batter?? I was wondering if we could use Greek yogurt in the pancakes - would that change the consistency too much? Darlene, the recipe says it serves 4 so 1/4 of the batter would be 1 serving. Either divide out the batter or just make your pancakes and divide them into four equal servings. these pancakes with almost 4 times as many carbs as protein… is just "sleepy food"… WHen you add syrup it becomes even MORE of a carb fest. Minimally you should use whole wheat pastry flour which acts like white flour but has 3 times the fiber. Maximally, you should eat one or two small pancakes and top it with cottage cheese or yogurt (infused with the maple syrup).